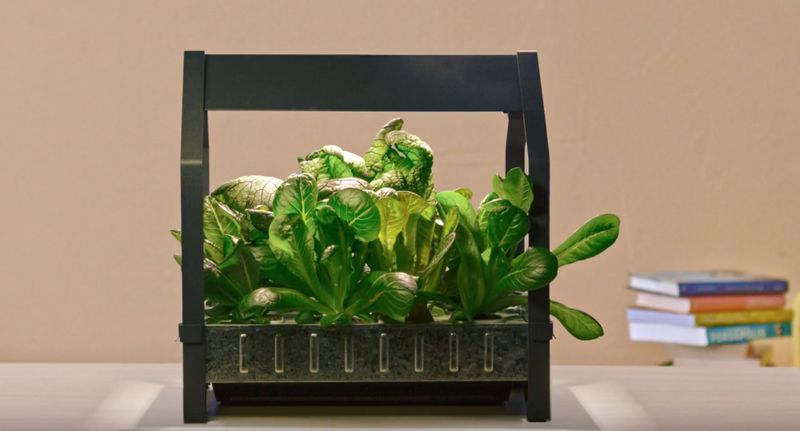 It's about time that Ikea designs their own interior garden system! Don't you agree? I've been searching the web for a while now to find an efficient, durable and reliable indoor garden system that won't break my pocket but it has been a challenge up to now. I've even considered building my own while looking at a few YouTube videos, but to be honest, it looks time-consuming to build. So I continued my search by googling "indoor garden DIY" and came across this Pinterest image of an IKEA indoor garden system! It honestly rocked my world until I realized it hasn't launched in North America yet. WHY are we so late on getting the "GOOD STUFF"? Anyways, I got so excited after seeing the IKEA promotional ad on YouTube, I absolutely had to share it with you! I can't wait until it launches in Canada. I need to keep posted so I can let you know when it's available in stores. Wonder why you may need this amazing indoor system in your life, let me drop some facts! Urban gardening is a recent movement that has been nascent for the past few years now. Majority of the population now live in large cities for better economic opportunities for work and education but as our society evolve, we are seeing less of nature around us. In fact, we spend more time indoors than our outside environment. For example, according to Cornell University, College of Human Ecology, on average, children are seated 84% of the time and standing 9% of the time during a school day. Without thinking about it, we know that this isn't healthy at all for our children. Same goes for us adults. We are seated approximately the same amount of time, if not less during our work or school day. Therefore, WE DO NOT HAVE ANY ACCESS TO NATURE! An experimental research journal (Designed Natural Spaces: Informal Gardens Are Perceived to Be More Restorative than Formal Gardens) done by the US National Library of Medicine & National Institutes of Health shows that there are "actual benefits to spending time in natural spaces compared to urban spaces, such as reduced cognitive fatigue, improved mood, and reduced stress" (Twedt, Rainey, & Proffitt, 2016). "Humans have an automatic positive emotional response and psychological preference for natural environments over urban environments, due to the fact that humans and pre-Homo sapiens evolved in and adapted to natural environments for millions of years" (Kaplan and Kaplan, 1989; Ulrich, 1995; Grinde and Patil, 2009). "Humans depend on nature for “aesthetic, intellectual, cognitive and even spiritual meaning and satisfaction” (Kellert and Wilson, 1995, p. 20). "While built environments—such as private homes, public buildings, and well-designed contemporary urban landscapes—also have the potential to enhance well-being (Kaplan et al., 1993; Scopelliti and Giuliani, 2004; Karmanov and Hamel, 2008), natural spaces might be particularly conducive to restorative experiences". NATURE IS A FUNDAMENTAL PART OF OUR LIVES! By contributing to the urban garden movement, you are contributing to your own health and well-being. Don't need a green thumb - easy harvesting, less over/under watering, no weeds, and controlled temperature. Your plant will actually make you happy!!! It's called plant therapy... look it up! Cornell University, College of Human Ecology, & Robert Wood Johnson Foundation. (2014). ￼ Children Move More and Sit Less During an Outdoor Garden Lesson, Compared to Indoor Classroom Lesson. Children Move More and Sit Less During an Outdoor Garden Lesson, Compared to Indoor Classroom Lesson. Retrieved from https://blogs.cornell.edu/wellsresearch/files/2015/02/RB2_Indoor_vs_Outdoor_February2015-t2byae.pdf.